The event was a lot of fun, and as an aspiring writer it was encouraging to hear that even a writer as successful as Kate still finds writing hard. MPR recorded the event for broadcast and you can find the full audio here. Afterwards Kate signed books and was gracious enough to pose for photos as well. I felt sorry for the parents further back in line though, as I have a feeling it took awhile to get everyone through. I had my copies of both Flora and Ulysses and Despereaux signed and, yes, had a photo taken. There aren't many people I'm excited to meet in person, but Kate DiCamillo is one of them. I mentioned Jane's workshop and she asked what I was writing. Really, I didn't steal the idea! 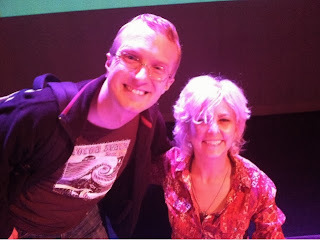 It's Kate DiCamillo! She writes great books! I had to pace myself so as not to tear through Flora and Ulysses in one sitting. It was wonderful, my favorite of hers since Despereaux. I especially loved Ulysses. The joy that fills him after his near-death experience is just delightful. In Jane's workshops we often talk about finding the one moment that sums up the emotional line of the story. In Flora and Ulysses the moment that jumped out at me was when Flora tells Ulysses, when he experiences a moment of indecision, "Remember who you are." My week at my day job after the book release event was a long and hard one. Times like that are always harder for me because I'd rather be writing, I feel I should be writing. But that line gave me something to hold on to. A good story is like that. So remember who you are, dear readers, remember.